All I have to do is just hear the name and I begin to drool. 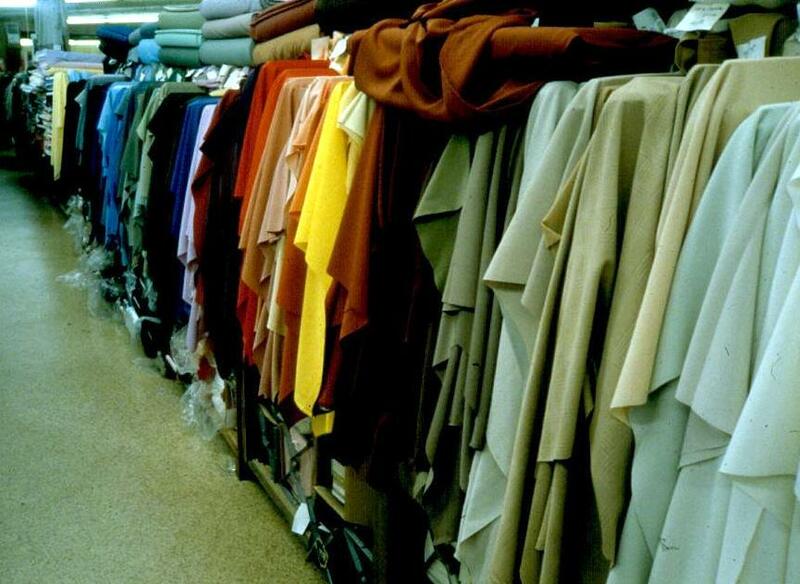 I’ve shopped for quilting fabric at Yoder’s Department Store in Shipshewanna, Indiana since 1976. I was fresh out of Kalamazoo College and working towards a Michigan teaching certificate as a 5th-year student at Western Michigan University. The year before I had written my thesis (The Old Order Amish: Compromise & Contradiction), after hanging around with a wonderful Amish family who lived between Middlebury and Shipshewanna. Ida taught me how to quilt. 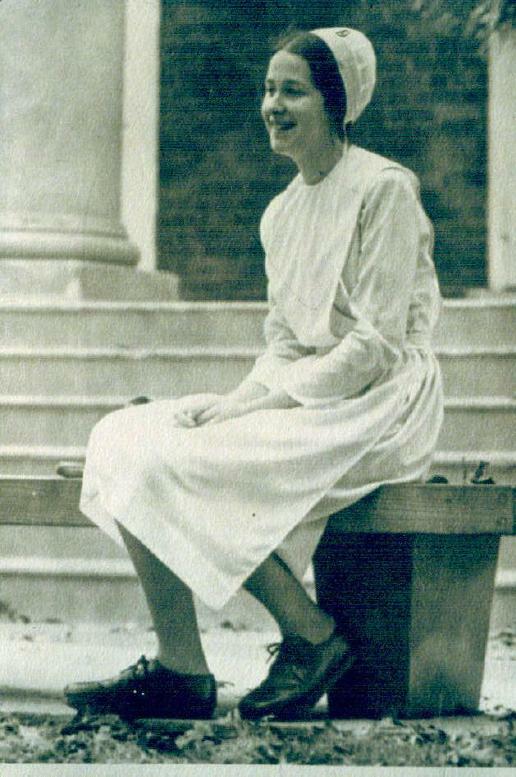 That’s me, dressed Amish (except for the Earth shoes) and that’s probably what I was wearing the first time I went into Yoder’s, totally clueless. My goal had been to learn about the Amish by participating in their culture, of course with permission, and with lots of guidance. Ida and her daughters helped me make my Amish outfits and took me wherever they went so that I could do whatever they were doing. I dressed Amish, ate Amish, did farm chores (poorly), and learned to speak about 14 words in Pennsylvania Dutch. One particular phrase got a lot of mileage: “Nay dange, Ich bin urshtum gooka.” (“No thanks, I’m just looking.”) That was my response when Mennonite shop clerks and local Amish would strike up a conversation with me in Dutch thinking I was Amish too! I remember Yoder’s before they had a Quilting Department and when most of the yardage on the bolts were polyester: blends, knits, and double knits. That’s what the Amish were wearing at the time and that’s what they were making quilts with too. I had never seen so many solids in my life. I bought fabric for my first dozen quilts at Yoder’s, all polyester blends, convinced that Michigan didn’t have appropriate quilting fabric! I’ve learned a lot since then, visited many a quilt shop, and bought more fabric than I’ll ever use, but I still love shopping for fabric at Yoder’s. I’m heading over to Kalamazoo on Thursday night after my lecture with the Lansing Area Patchers to see our daughter. After she heads off to work Friday morning, I’m driving south to “Shipshe” to buy some batiks for a few new Rag Fur Jackets! This is your official invitation to join me in the Yoder’s fabric department on Friday morning, February 5th. Don’t be shy; come and find me. I’ll be the one messing up the bolts, unfurling, squinting, petting, and making piles of my favorites. I will be there for hours. For lunch let’s go to the Essenhaus! If you’re my friend on Facebook see who just happened to be there too. I *wish* I could join you. Trips to Shipse are one of the things I miss since moving from Michigan to Texas. I will see you at LAP on Thursday. Have you ever had lunch at the Village Cafe? — next to Gohn’s in Middlebury. — wonderful pork tenderloin sandwich. We save Das Essenhsus for dinner. Oh, I WISH I COULD . . . . we lived in that area for 12 years. Essenhouse … YUM! I would love to, I’m only an hour away. I absolutely love Yoders and Essenhaus IS THE BEST!! Love those pies. I want to come, but I am teaching a color theory class in the morning and hubby has to go to work at 2:30pm. Maybe if I drive really fast I can make lunch. How far is it from W/S NC to Shipsh.? 800 – 1,000 miles! I’ll be thinking of you fondling all that lovely fabric, and wishing March 24 would hurry up and get here! My galpals and I will be heading for Lancaster that morning, for the “new” AQS-sponsored show. I’m thinking it will take awhile before it comes close to being as great as the Barber Diversified QHC- but willing to give them a chance to show what they can do. At the same time, we will shop all the Amish and Mennonite drygoods stores (and a few actual quilt shops like LadyFingers and Martin’s Hayloft) while in the Lancaster, PA area. One of the ladies is coming from AZ to join us. Her first time in PA Dutch country! How I wish I could. fabric stores make me drool too! I wish….but I have a job that expects me to show up on weekdays. I’m actually thankful for the job, since I live in MI and our economy isn’t the best. So, have fun and fondle fabric for me. I got a GORGEOUS batik there too – would you believe I almost missed the batik section? I definitely made up for it! Did you know that Ricky Timms will be in Shipse on Friday? He is doing a morning and afternoon workshop, and a concert in the evening. The town should be full of quilters! I’d be there in a shot if i didn’t live in northern california. it sounds like heaven. 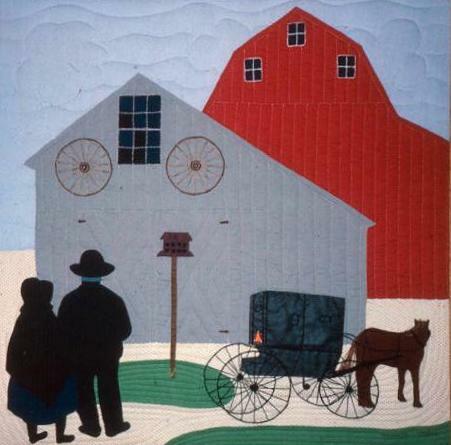 i love your amish/barn quilt –it’s so simple but lovely. have a great, great time. Your invitation is SO tempting. Of course, I can’t come but just the thought is very appealing. I hope you find the exact fabrics you are looking for. Have fun! I’ll be there in spirit, Ami! I’ve been to Shipshewana once with aunts and cousins…before I started quilting and back in the 70’s when cotton poly was the fabric of choice. You’re right about all the solids! It’s a really cool town! But if you’re having mush, you must have it with maple syrup! My Grandma and all her friends spoke Dutch. We used to love listening to her talk to friends. My Mom taught me the days of the week and some phrases. I remember one (and I have no idea how to spell it) “Shank do gow gook minitens mow” – Don’t look a gift horse in the mouth. I say it to my kids all the time! Have a great time! Our Quilting Beehive (www.quiltingbeehive.com) “swarm” somewhere in the USA once a year. For two years we have stayed at Farmstead Inn in Shipshe….and shop at Yoder’s. Wish I could join you so I could meet you. I’ll be in Shipshe at the Ricky Tims seminar at the Blue Gate. But I might be at Yoder’s after the last part before the concert. So I might see you! Have fun! I wish I could join you! What a great time you’ll have! I have also been to this store when I was teaching in the area. One fun memory was the occasion to eavesdrop on three Amish quilters as THEY planned their next quilt! Oh Ami, Good memories at Shipshe. My in-laws live in Indiana and when they got wind I was a new quilter they knew right where to take me. Can you say overwhelmed as I walked into Yoder’s? I was in there for two hours and came out with a pre-printed pillow panel! I’m happy to say I’ve progressed since then. Have a great time shopping for solids. Never been there but would like to some day. Maybe I can get daughter Vickie to go sometime. You’ll have to tell me all about it when you return. I’ve only been to Shipshewana once in my life and I’m sure it was in the early 1980’s with my friend Patty Such from Lansing. Would love to return someday. Love to meet you there but its a little far away!! Last time I was in Yoders it was amazing, also check out the wonderful Christmas baubles shop near the Post Office. Gorgeous blown glass ornaments. I think of Shepshewana every Christmas when I put them on the tree. Have fun. Most of my family lives in NE Indiana and every time I visit we take a girl’s day to visit Shipshewanna – even though I do not need a thing. The two must shops are Yoder’s and Lolly’s. I am in fab addict heaven! BUMMER!!!!!!!!!!!!! !11 i have to work. too bad you aren’t coming on sat. IT’S PAJAMA DAY. started by lolly’s and now involves the entire town. They do online orders! It would be much nicer to be there in person though :( Have fun! Would that I lived near by. I’ve been to Lancing and to the Yoder fabric department when I lived in near by (sort of) Virginia. Now I’m in Oregon. …Essenhaus – Eating house! Now that sounds like fun too! Have a pretzel for me! Don’t forget to stop at Gohen Bro.’s in Middlebury. While shopping for fabric downstairs you can hear the whurrr of sewing machines upstairs from the Amish ladies sewing garments for sale to the other Amish. I think there will be a couple of us ready for lunch! We are leaving Kzoo about 10. See you at Yoder! I’ll have on my rag fur jacket. I’d love to meet you at Yoder’s! Only trouble is, I’ll be on a retreat in Princeton, IL. Yoder’s sure is an interesting place. We stopped in t here on our way to my nephew’s wedding in Auburn Hills in June. I waved as we neared Flint. Did ya see me? Anyway, don’t buy everything, I hope to visit this summer with my bee. I’ll let you know when, maybe we can meet up then, and then get some custard pie! We must do it again….and raise our square yard sticks to the occasion. Tourons of the World Unite!!!! On my first trip to Yoder’s several years ago, I bought around $100 worth of fabulous fabric and received a free metal souvenir spatula with Yoder’s name on it. When I got home, I showed my purchases to my husband with the explanation that I bought this wonderful little spatula and they threw in all this free fabric! It took a second beat for him to catch on to my twist. Oh how I liked Yoder’s and Shipshe. We had a cottage at Lake Oliver, and I remember going over there a few times as a child. When my oldest daughter considered going to Kalamazoo for college, we visit Shipshe as a family. It was their first time to really see the Amish. Looking forward to seeing you in August in Woodbridge, Va.